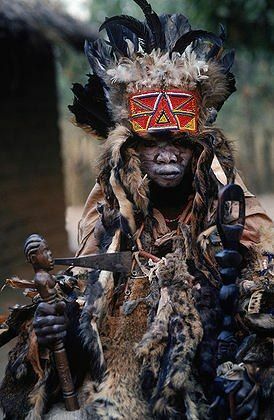 The African Witch Doctor played an important role in building up our health care system in the United States. Much of our medical practices were advanced tenfold by West Africans and people from Africa. For many centuries, people treated sicknesses and injuries with a wide variety of curative potions. During these periods of time, medicine and superstition went hand in hand with each other. The famous symbol of two snakes entwined in a staff is based on the Greek and Roman myth about Aesculapius who was supposedly the sun god. It was believed Apollo sent two magical snakes to his son with instructions to teach him about the art of healing. Hippocrates was known in the western part of the world as the Father of Medicine. He created the “Hippocratic Oath,” which was adopted as an ethical code of conduct. The Chinese used acupuncture to relieve pain that can be traced back to 2500 B.C. They knew about blood circulation long before William Harvey, the English physician who was credited with its discovery in 1628. By the third century A.D., the Chinese had identified the cause and treatment for vitamin-deficiency diseases. The ancient Egyptians and the Incas of pre-Columbian Peru knew how to perform surgery on the skull, and physicians in the 15th century West African kingdom of Songhay were counseling women to space their children apart two to three years for better health of the mother and child. In the great and advanced cities of Timbuktu and Gao, doctors were routinely performing cataract surgery. In the melting pot of the United States, Indians, Asians, Africans and Europeans each had their own ways of taking care of the sick. All of these practices were combined to form the core of modern medical practices. 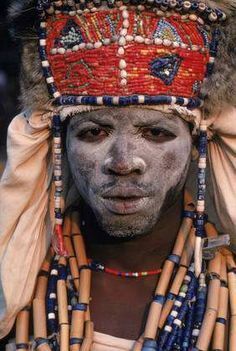 You know the African witch doctor as a man dressed in a tribal clothing, wearing mysterious masks and using outlandish potions from mass media and television. Eventually, witch doctor would become associated with incompetence and chicanery. The facts are distorted in this manner. Africans arrived in European colonies with advanced knowledge of roots and herbs and how to use them to treat ailments. It didn’t take long for white people to realize that Black people had treatment techniques and ways of curing disease that were superior to their own. 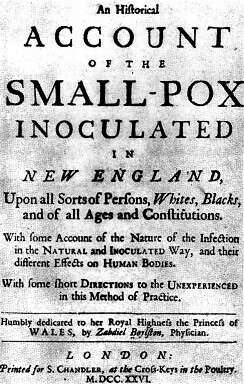 Mather wrote to his friend, Dr. Zabdiel Boylston, and requested a widespread smallpox inoculation program. Boylston inoculated his son and two so-called slaves with success. But white people were racist. In Boston, Philadelphia and New York, laws were even passed to outlaw inoculations. People died. Years later, George Washington had all of his troops inoculated for smallpox, precisely the way Onesimus had described. 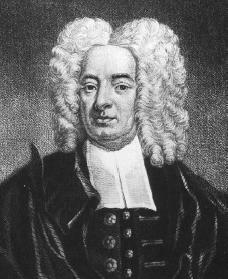 But of course it was Boylston who got credit for it and was honored in London and then made fellow of the Royal Society. It was noted, “Whites on the other hand were often treated by blacks throughout the colonial period and they (black doctors) were valued as slaves and as members of free communities as well.” Even though laws popped up to stop black doctors from treating white patients, that didn’t stop black or white people from using them. In 1792, a black man named Cesat gained respect for his understanding of roots and herbs. The Massachusetts Magazine noted some of Cesat’s cures. Cesat cured poisoned victims, snake bites and other cures. Some of our most common drugs we use today are derived from African and African-American medicines. For instance, plants that contain acetylsalicylic acid, come from the wisdom of the Bantu people from West Africa. This is commonly used to stop headaches and stop joint pain and swelling. 40 years after Africans had been practicing its use, Felix Hoffman rediscovered it and then called it aspirin.